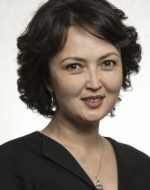 She was born on December 14, 1979 in Kokshetau. From 1997 to 2001 she graduated from the Higher School of Law "Adilet", majoringin Jurisprudence. From 22.10.2014 to the present time Deputy Director of the Department of Subsoil Use of the Ministry of Investment and Development of the Republic of Kazakhstan.